A few weeks ago I had the opportunity to experience 4 minutes of weightlessness, but not in the traditional sense. Normally to experience 4 minutes of weightlessness you would need to go really high in a rocket ship. 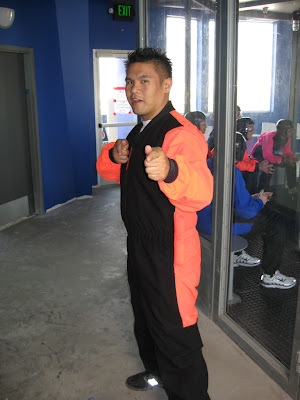 I did the poor man's rocketship at iFly - the indoor verticle wind tunnel in Union City. I had 2 "skydives" of 2 minutes each. It wasn't exactly a replacement of the real thing, but it's something to do once in your life. After watching the videos online, I thought I was going to some Matrix-like stop action stuff like the Trinity pose or the Neo bullet dodge. The reality was that I had a hard time just staying in place. You start off by going to a 10 minute flight training session where they say that you need to be relaxed in there, don't find the wind and don't make major movements. I did everything but what they told me. I was pretty tense and I was flying all over the place. Luckily the instructor is in the wind tunnel with you and keeping you from crashing into the window. At the end of the whole thing the instructor does a demo of all the tricks that they can do which makes you feel like a dipsh!t because you can barely keep your position while he's doing Morpheus moves. Although it's a little expensive, I recommend that you check it out. Big Al approved! Dymn Alan! If you were gonna spend that amount of money in an indoor skydiving place, you should grow a REAL PAIR OF NUTS & skydive out of a REAL FREAKING PLANE from at least 30,000 feet! Its the best rush ever... if you need someone to hold yer hand & go with you, I'll mos def skydive again! Big Al's V-towne house involved in arson?